I've been on a bit of a chili crisp mission lately. 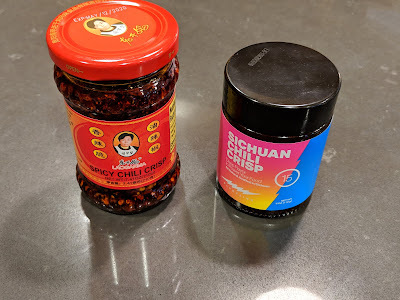 The Internets -- and my friends -- appear convinced that the best chili crisp is Laoganma. Or Flybyjing. Certainly one of them. 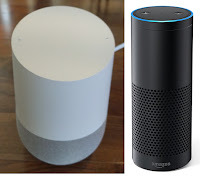 But which? Laoganma, on the left in both photos, has more "crunchy bits", but also has fewer suspended solids in the oil. The bottle is about 3/4 full of the solid crispy bits. The flybyjing bottle is only about 1/3 full of crispy bits. Daniel Lemire and Maxime Chevalier just had a great exchange on Twitter about the state of compilers and being able to automatically vectorize code, such as a scalar product. Of course, hoping the compiler can correctly vectorize your code can be a bit fragile, and as Maxime points out, writing raw intrinsics results in an unreadable pain in the editor, and a GPU-style implementation in CUDA or OpenCL might be more scalable and maintainable. As you may have guessed from my recent post analyzing the TCO of my former automobile, and my post on finances for CS Ph.D. students, I've been thinking about finance a bit lately. 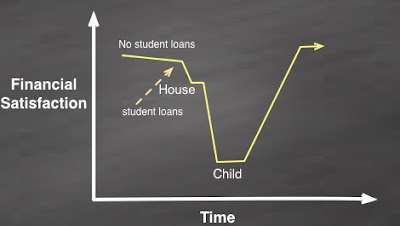 After a thought-provoking discussion with a senior colleague in another department, I've come to the conclusion my financial satisfaction graph looked something like this -- and I bet it's similar for many other no-kids-at-completion academics who end up enfamilied (can I make up that word?). In discussions on Hacker News, I repeatedly see comments about "nobody ever implements sorting algorithms" -- or, generalized, that it's a waste of time studying up on basic data structures and algorithms, because they're all already implemented. While it's rare, it's not been my experience to never re-implement the basics. I decided to data-mine my and my research group's past and current projects to identify the number of places we've implemented elementary data structures for good reasons. Sorting In the Cuckoo Filter, we implement a custom sort to sort the four items that can go in a bucket. Because this is a high-performance context, and the size of the set to be sorted is fixed and small, it's much faster to do this inline. 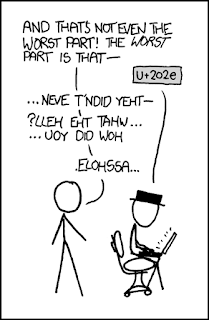 This sort only cares about the least-significant byte of the key. This post is based upon a few recent conversations I've had with my own Ph.D. students. Its intended audience is Ph.D. students at mid-to-upper-end computer science programs in the United States, who are either US citizens/permanent residents, or plan to remain and retire in the U.S. 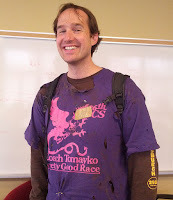 Welcome to graduate school in computer science, where not only do we not charge you tuition, but we shower you with so much money that you can afford to eat, have a house over your head, and wear shirts that have fewer than five holes in them! In fact, you can probably do better than that, and get a nice boost to being financially independent. But it takes some advance planning.